" Slowly, ..., the fact is becoming recognised in ever wider circles that the vernacular literature of ancient Ireland is the most primitive and original among the literatures of Western Europe, and that in its origins and development it affords a most fascinating study. Whatever may be its intrinsic merit, its importance as the earliest voice from the dawn of West European civilisation cannot be denied." "It was only on the outskirts of the Continental world, and beyond the sway and influence of the Roman Empire, that some vigorous nations preserved their national institutions intact, and among them there are only three whom letters reached early enough to leave behind some record of their pagan civilisation in a vernacular literature. These were the Irish, the Anglo-Saxons, and, comparatively latecomers, the Icelanders." "It was during this period [4th century onwards] that the oral literature, handed down by many generations of bards and story-tellers, was first written down in the monasteries. Unfortunately, not a single tale, only two or three poems, have come down to us from these early centuries in contemporary manuscripts. In Ireland itself most old books were destroyed during the Viking terror which burst upon the island at the end of the eighth century. But, from the eleventh century onward, we have an almost unbroken series of hundreds of MSS. in which all that had escaped destruction was collected and arranged. 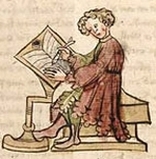 Many of the tales and poems thus preserved were undoubtedly originally composed in the eighth century; some few perhaps in the seventh; and as the Irish scholarship advances, it is not unlikely that fragments of poetry will be found which, from linguistic or internal evidence, may be claimed for the sixth century." "The purely lyrical poetry of ancient Ireland may be roughly divided into two sections--that of the professional bard attached to the court and person of a chief; and that of the unattached poet, whether monk or itinerant bard." "Religious poetry ranges from single quatrains to lengthy compositions dealing with all the varied aspects of religious life. Many of them give us a fascinating insight into the peculiar character of the early Irish Church, which differed in so many ways from the rest of the Christian world." "In Nature poetry the Gaelic muse may vie with that of any other nation. Indeed, these poems occupy a unique position in the literature of the world. To seek out and watch and love Nature, in its tiniest phenomena as in its grandest, was given to no people so early and so fully as to the Celt. Many hundreds of Gaelic and Welsh poems testify to this fact." "Of ancient love-songs comparatively little has come down to us. What we have are mostly laments for departed lovers." "The commonest stanza is a quatrain consisting of heptasyllabic lines with the rhyme at the end of the couplet." Kuno Meyer, Ancient Irish Poetry (London 1913, repr. 1994) vii, viii, x-xi, xii, xiii. Eleanor Knott, Irish Classical Poetry (Cork: Mercier Press revd. ed. 1966), contains some information on early poetry.